David Cameron has promised that halal slaughter will be “safe in Britain” for as long as he remains in power, decrying the “intolerance” towards Muslims that exists in some parts of the country. The prime minister, who made similar promises with regards to kosher meat on a visit to Israel last month, said his government would never put restrictions on religious slaughter, which often includes animals that are not stunned before they are killed. 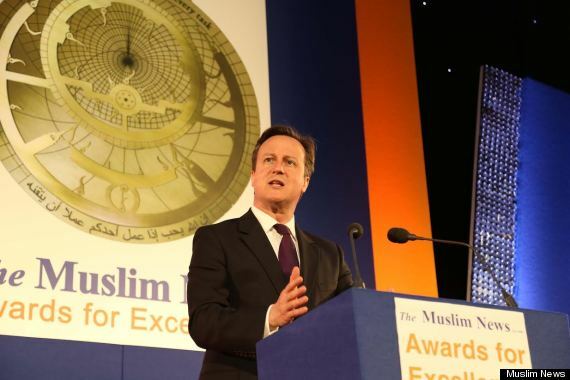 David Cameron at the Muslim News event Speaking at the Muslim News Awards for Excellence in London, Cameron said: “Really tackling Islamophobia means making absolutely sure that no Muslim is held back from living their life or reaching their goals, simply because of the faith they follow. He promised that the government would “keep on challenging the intolerant view of Muslims that exists in some parts of our country”. Some animal rights campaigners complain that halal and kosher slaughter is cruel because the animal is killed by slashing its throat while it is fully conscious. But proponents of the method say it means animals are killed by a trained professional, rather than a machine, and lose consciousness within seconds after an artery in the throat is severed. The Danish meat industry bans the slaughter of animals which are not stunned prior to death. Earlier the prime minister was introduced by the hosts at the awards ceremony as a descendant of royalty, and responded by joking that he was “only related to William IV because he did something he shouldn’t have done with someone he shouldn’t have been with”. But Naved Syed, halal adviser to the Yorkshire Association of Asian Businesses, disagreed. He said: “It’s all lip service. He’s just trying to get Muslim votes and say he’s doing something for the Muslim community.